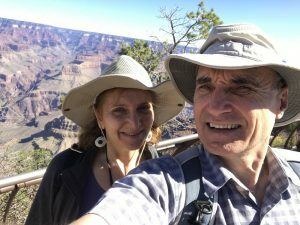 Here we are at the Grand Canyon, one of the Seven Wonders of the Natural World. Our first time being here! You can see a glimpse of the canyon behind us. For many couples their marriages would reflect large canyons between each other. Yet, by the grace and help of our Lord Jesus, we have not had canyons in our relationship, nor have we had deep valleys or high mountains to traverse. That does not mean that we have not had struggles or challenges, for there have been many. However, our commitment to understand, serve and support each other has enabled us to continue strong in our friendship and our marriage. We love being together, praying with each other and sharing our faith and life with each other. Lord Jesus, thank you for giving life to us, helping us to be faithful to each other, and giving us joy in our relationship.